Using kosher salt in this recipes gives you cookies in which you can taste little bits of salt, which I think complements the caramel nicely. However, if you prefer, use 1/2 teaspoon of regular table salt instead. Add egg mixture to flour mixture and process with long pulses until the dough comes together in large clumps. (You may need to stop and scrape the sides of the bowl.) Turn dough out onto a piece of plastic wrap, press into a disk, and chill for 1 hour before rolling. Preheat oven to 350 degrees. Roll dough out on a lightly floured counter to scant 1/4 inch thickness and cut. Using the large scalloped cutter, cut shapes from the dough and place on the prepared baking sheet. Using the small scalloped cutter, cut a hole from the middle of half the cookies. Repeat with the remaining dough, incorporating the scraps until all the dough is used you should have 10 solid cookies and 10 cut out cookies. Bake 8 to 10 minutes, until lightly colored. Let cookies cool slightly on cookie sheets and then transfer to a wire rack to cool completely. Sift confectioner's sugar onto the cut out cookies. 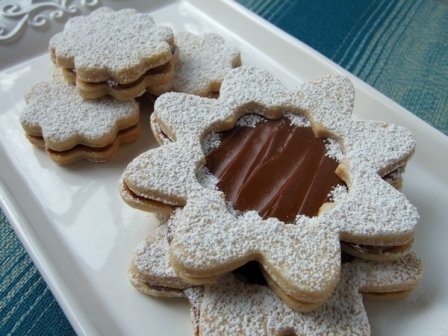 Spread a heaping spoonful dulce de leche onto the underside of the solid cookies. Carefully place a cut out cookie on top.